Could this leaked design be the next Google flagship? Since its first Pixel handset, Google hasn’t messed too much with the design language of its flagship handset, but if this latest leak is to be believed, the Google Pixel 4 could be going all-screen. 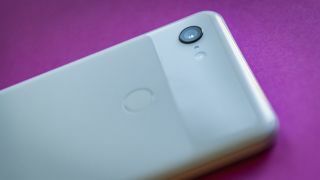 According to 91mobiles, a patent has been filed by Google with a number of figures that show off the all-too-familiar design of the Pixel range of handsets, with the rear sporting the same glass top, two-tone design featuring a fingerprint scanner and single camera as can be found on the Pixel 2 and Pixel 3. The edges, similarly, are unchanged, with volume and power buttons on the right-hand side, a SIM-card slot on the left, and a USB-C port on the bottom. The display, however, has practically no bezels and is completely notch-free. There doesn’t seem to be any trace of a pop-up mechanism or pinhole cutout for the selfie camera, nor for the dual speakers found on the Pixel 2 and Pixel 3, so if these figures are to be believed, the Pixel 4 may have some other clever solution up its sleeve. Of course, considering that these are essentially sketches, the figure showing off the front of the device may just be lacking the finer details – such as cutouts – that will eventually follow in an updated patent. Alternatively, it could just represent a single pane of glass, with a chin and top bezel housing the appropriate sensors and lenses still being located beneath the glass, above and below the display. In fact, this patent may not even be related to the Pixel 4, it could well just be Google getting in ahead of time to secure the design down the line. Considering the Google Pixel 3 only launched as recently as October, we’ll have to hold out for quite a few more months before we get any definitive word on what the next flagship will look like.